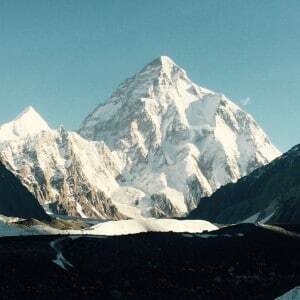 K2 is a fascinating mountain, and the world’s 2nd highest peak. 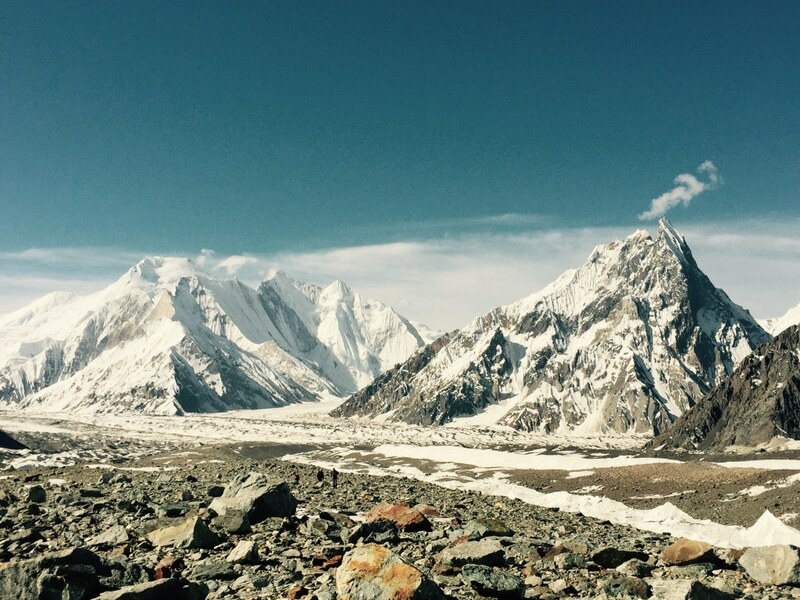 The K2 Base Camp Trek is one of the greatest adventure treks in the world. The mighty mountain stands high above all others in the rugged Karakorum range of the Himalaya’s. We have added in additional acclimatization giving you the best chance of success. We have a great team of trusted staff on the ground in Pakistan. Ian has climbed Everest to the top and lead over 100 treks and climbs around the world. 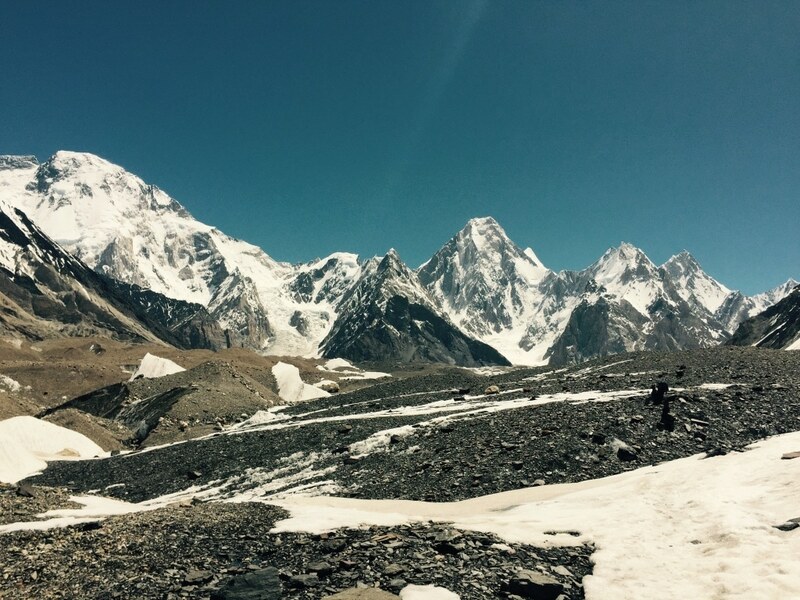 The journey into K2 base camp is truly astounding, you will discover amazing cultural diversity, and real adventure. This trek is achievable for most fit trekkers and rated as one of the best treks in the world. Our route through the Concordia up the Baltoro Glacier starts in Islamabad with flight into Skardu, then the long strennous trek up past Broad Peak to K2 Base Camp where we spend a night, allowing time to absorb the unique atmosphere and environment surrounding this unforgettable mountain. 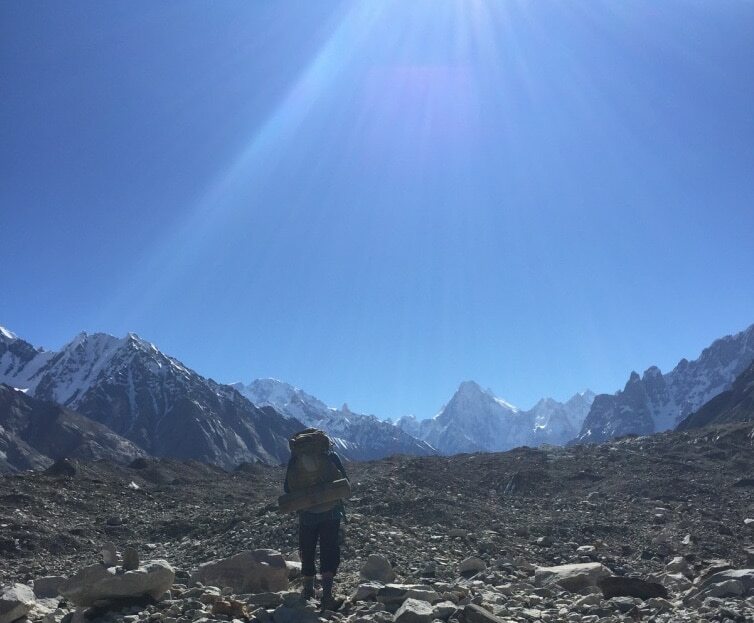 Our return trek takes us the same route unless we try little harder route to go over the spectacular Gondogoro La, a dramatic high col that affords further stunning views of the Gasherbrum peaks. We purposefully cross this pass in the early hours of the morning so, given good weather, we are rewarded with tremendous golden sunshine in one of the most dramatic places on earth. Read some REVIEWS from our trips. Your K2 Base Camp Trek experience will arguably be the most spectacular trek you will ever undertake, with multiple views of the world highest and most difficult mountain. You will get awesome views of K2 and Broad Peak Fascinating insight into the lives of the Balti people. The Balti people are some of the friendliest and happiest folk I have met, always singing and dancing. Don’t expect the horror stories of the past, gone are the famous Balti strikes and it is wonderfully clean both on the mountain and in the cities you will visit. Our experienced professional Licensed guides, will provide all necessary information on arrival in Pakistan. We will take care of all necessary documentation to enter this mountain region. Our guides and local staff will cook meals while porters will carry your personal kit all the way up and down the trail. The trek is strenuous and demanding not dangerous but the rewards are spectacular and you should make sure you are fit and used to hiking long days before considering joining this trek. You will be trekking up to 7 hours per day. Price start from $3,600. Your day normally starts at 6am or 7am; the routine during the trek is early to bed and up early each day. Early wake up with a mug of steaming tea or coffee while still in the bed, before the sun rise. You will pack all your equipment and after hearty breakfast you will be on the trail. The local staff either provide you packed lunch or will give hot lunch on route to the next camp. It will be cold in the morning but quite warm during the day if the weather is pleasant, some days are even hotter you need to wear t-shirts and shorts. Fly to Islamabad, You may choose to fly in a day early to have an extra day in Islamabad and do some sightseeing. We can arrange this for you. You should aim to arrive the day before the trek. There are plenty of sights to visit and explore. Two nights accommodation in Islamabad is included in the cost of the trip. One night before and one night afterwards. You will arrive in Islamabad with time to relax and enjoy a well earned rest in our very comfortable hotel, go swimming in the hotel pool or catch up on some sleep. We will take you on a tour of the exciting bazaars of Rawalpindi where you will see lots of gold, silver jewelry, Kasmiri shawls and Bokarra carpets. 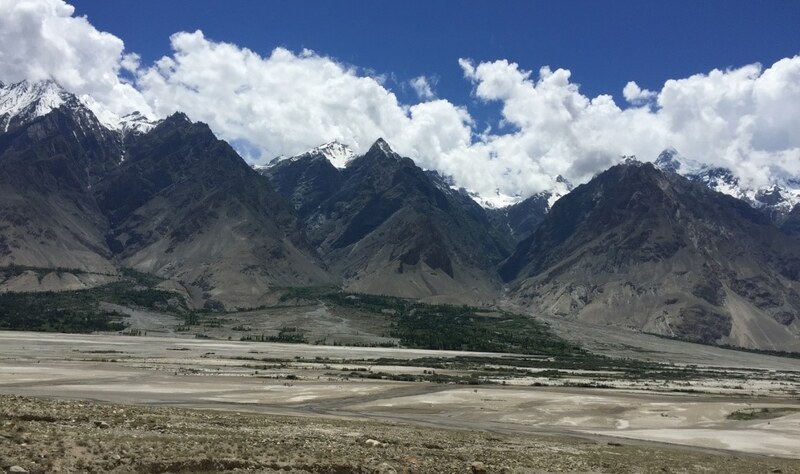 We complete to Skardu our journey in around 8 hours passing Nanga Parbat and the stunning panoramic views of the surrounding mountains. You will look back in awe and reflect on what an amazing civil engineering achievement the Karakoram Highway was in its time. 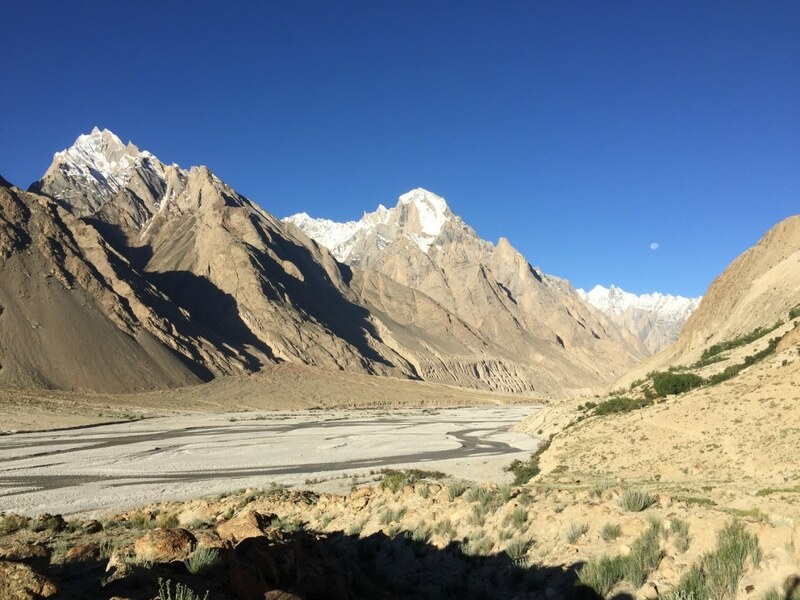 You will have crossed the point where four great continental plates come together forming four of the world’s greatest mountain ranges (Himalaya, Karakoram, Hindukush the Pamir. An evening Barbeque is provided and the Baltistan culture will start to unravel. We will spend the day in Skardu walk around acclimatize around the Sadpara lake or Khurpocho fort while the guides deal with paper work for entering the region. Today we take a Jeep ride to Askole 3,300m/ 10,827ft. the last village between us and K2 from where we begin our trek towards K2 the following morning. We set off early to avoid the heat of the day. The route is gentle and enjoyable. 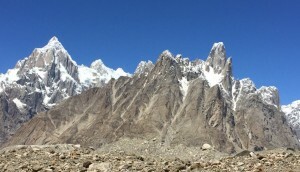 We cross the Biafo Glacier on the way and get our first sight of the Paiyu pinnacles. We will be trekking for 5 hours today. Trek to Paiju (3,380m) 3 to 4 hours walking. After an early start from Bardumal we will arrive at Paiju midmorning. The path is quite loose in places and again it is likely we will have to take boots off where the river has flooded the path in a few places. Paiju is a green oasis under the shadows of Paiju Peak (6,611m). From this camp we have the first views of the immense Baltoro Glacier. Overnight camping (B,L,D). If the river is sufficiently low we will edge our way round the base of the huge rock walls that guard the valley towards the Baltoro glacier. If not then a higher traverse will be taken before we regain the old river bed that leads to Paiju, our campsite for the next two nights. Despite the stories in old guide books and journals, much has been done in recent years to remove rubbish and human waste to leave an incredibly clean environment with well managed camps. In fact they are some of the best we have seen. We will be trekking for 8-9 hours today. Today is a rest day to aid acclimatization and an important resting point for porters, they prepare food for the trek ahead. Normally there is much singing, drumming (or barrel bashing) and dancing amongst the porters with a real feel good atmosphere! We will get our first sights of the Trango and Cathedral Groups. 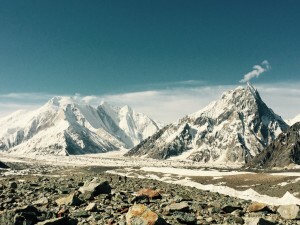 Today you should get your first distant sight of Broad Peak and the Gasherbrums peaks. 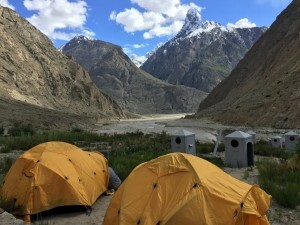 The campsite is located on a grassy slope high above the Baltoro and commands one of the most intense mountain views in the world which is dominated by the nameless Tower, claimed to have the tallest granite wall in the world. We will be trekking for 4 hours today. We are now in the heart of Concordia with only ice on which to place our tents we are surrounded by views of the great peaks: Muztagh Tower, Gasherbrum 4 and the most spectacular of them all Masherbrum, it’s guaranteed to take your breath away. If we are rewarded with a clear evening, nothing will have prepared you for the evening sunset and the red hue over Masherbrum, it will never be forgotten! We will be trekking for 7-9 hours today. If the mountains had been placed in order for this trek, today would have won an Oscar. 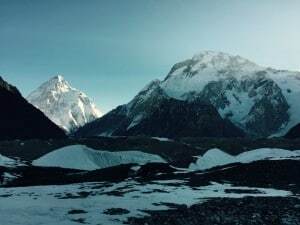 We move up to Concordia passing the Golden Throne and Mitre Peak as we enter the arena of the 8,000m/ 26,247ft. 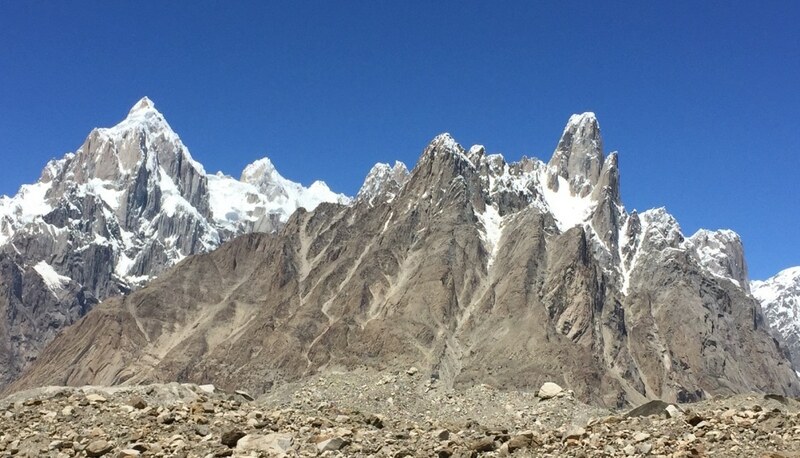 Peaks, first Broad Peak 8047m/ 26,400ft. followed by the Gasherbrums and finally K2 8,611m/ 28,251ft. The sheer size and scale of the 8,000m peaks defies description, this is a very special place and for many the view is a lifetime goal. 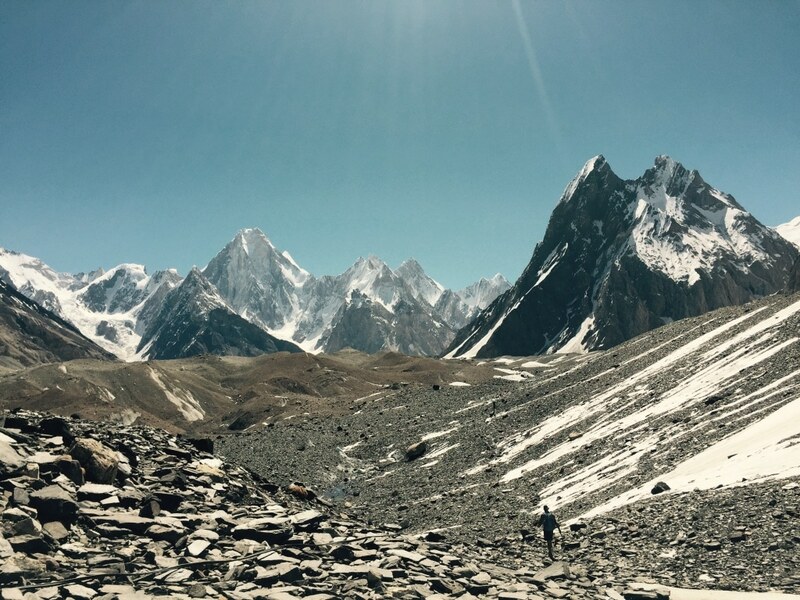 Unlike many other treks to this area, ours continues up to K2 base camp where you will stay for a few days to enjoy the sheer majesty of K2 and its supremacy over this whole region. We will be trekking for 8-10 hours today. Today Rest Day at K2 Base Camp or trek to Broad Peak Base camp. If you start early in the morning you can return to Concordia in the evening . Our return trek is via same route, after resting at base camp and acclimatizing properly it is easy to trek out faster than trekking in, it takes 4 to 5 days to reach to Askole. 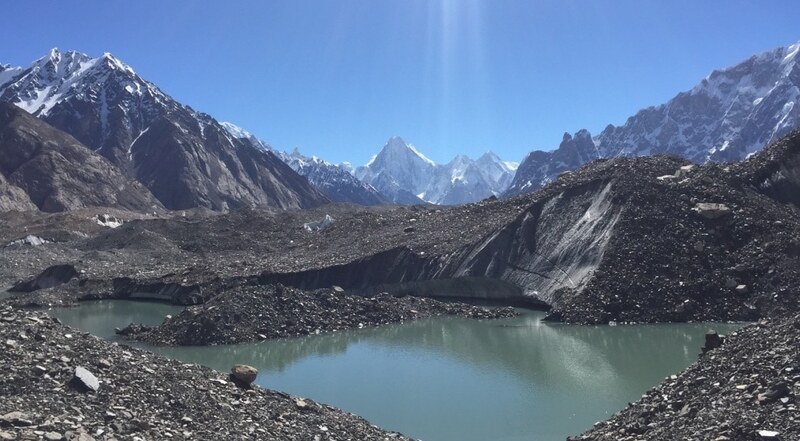 Our return K2 Base Camp Trek is via same route, after resting at base camp and acclimatizing properly it is easy to trek out faster than trekking in, it takes 4 to 5 days to reach to Askole. Return drive to Skardu and your K2 Base Camp Trek is almost over. We have to make our way back to Islamabad. You will have the day in Islamabad or you will be driving back to Islamabad. After a shower and nice night in our hotel you will be transferred back to the airport for your return International flight home. 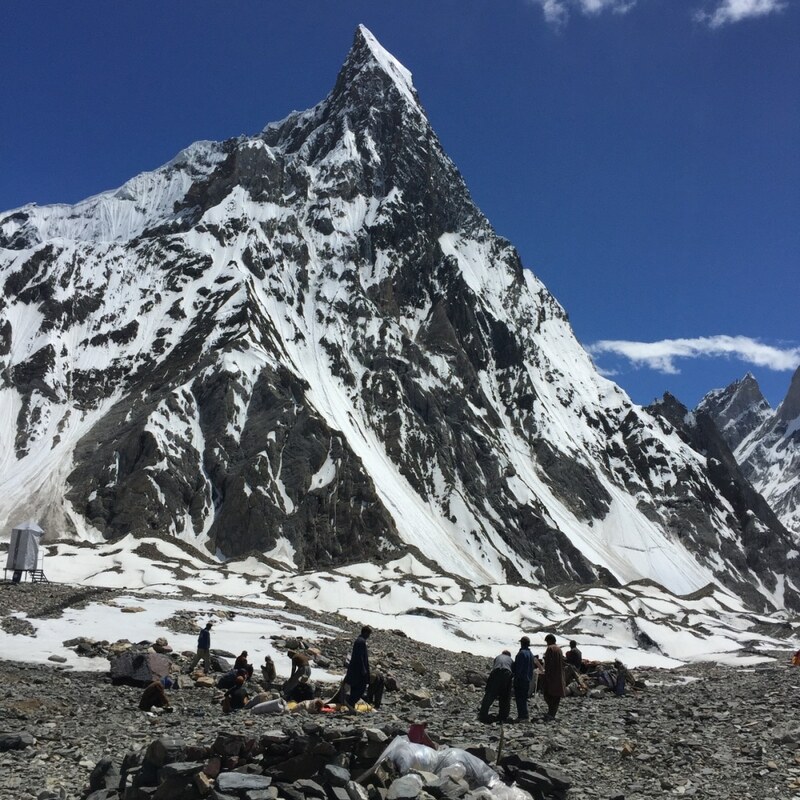 Does our K2 Base Camp Trek information excite you to take the next step towards achieving the world’s 2nd highest mountain. If so, get in touch today. We pride ourselves on making sure that our clients have every opportunity to succeed in the mountains, including professional training advice, gear lists and video links on how to pack your bag, and much more. We are always available to answer any questions you may have by email, phone or skype, so contact us today!